If you don't use your starter, you still have to feed it. Cooks have been baking with starters for thousands of years. Before mankind figured out how to enlist the aid of the micro-organisms known to us as yeast, all bread was unleavened -- that is, it was "flat" (like pita, tortillas, etc. ). Simply put, bread didn't rise. Sometime back before the ancient Egyptians, however, bakers learned that if they captured airborne wild yeast, and fed and nurtured it properly, they could produce an endless array of breads, cakes, pancakes, biscuits, scones, muffins, rolls, all light and fluffy and made possible by the hard-working little fungi (that's what yeast is -- a fungus). Such starters were vital in the pre-modern kitchen or even around the campfire. During the California goldrush, grizzled prospectors were known to spend cold nights curled around their crock of starter to keep it from freezing. Ironically, however, starter is able to withstand cold extremes more readily than heat. If you know someone with a supply of sourdough starter, they will probably be delighted to give you some of theirs, just as you will be happy to share yours after you get it going. Some strains of starter can be traced back in this country for hundreds of years, and around the Mediterranean for thousands. There are many sources, both retail and mail order, for sourdough starter, either in liquid or powdered form. Each will be accompanied by instructions for care and feeding. Making your own starter is fun and interesting. There are two ways, one of which relies upon store-bought dry yeast, and the other, capturing wild yeast from the air. No question about it, the method using commercial dry yeast is the more foolproof, successful way to produce starter. You can never be quite certain what you'll come up with when you go after the wild stuff, but that's a big part of what makes it fun. Into a clean, 2-quart glass or ceramic bowl, jar or crock, pour the water. Dissolve first the sugar or honey, and then the yeast. Gradually, stir in the flour. Cover the container with a clean cloth (not plastic wrap or waxed paper -- you want the air to be able to get through) and put it in a warm place (between 80 and 85 degrees, ideally). The mixture will start to "work" almost immediately with small bubbles forming on the surface. Stir it once per day and, in three to five days, the bubbling will subside. Give it a good, healthy sniff and, when it has a clean, yeasty, sour smell, it's ready. Give it a final stir (it should have the consistency of pancake batter), cover loosely and refrigerate. .
To make sure you're starting with no undesirable bacteria, scald the container your starter will be going into with boiling water and drain. Mix the water, sugar or honey and flour as described above, and cover with a clean cloth. Set the container in a warm place in your kitchen. Give it a stir every day. If you have been successful in trapping wild yeast, it should start to "work" within a few days. Let it work for three or four days, stirring it each day. When the smell is yeasty and sour, transfer it to a clean container and refrigerate until you're ready to use it. This is important: If the mixture develops mold, turns an odd color (pink, orange, green, blue) or smells anything other than sour and clean, throw it out. The wild yeast in your kitchen just may not want to cooperate or there may not be enough present to start the starter. If the water in your area contains chlorine, use distilled water or tap water that you've allowed to set out for 24 hours when you make your starter. Chlorine can put a lid on the development of yeast. Your sourdough starter will live in the refrigerator -- bottom shelf preferred. Use only glass, glazed ceramic or crockery to hold your starter. No metal or plastic. And start clean, and keep it clean. Every so often, you can dump the starter into a temporary container while you wash its permanent container in hot, soapy water. The container should be covered, but the lid should not be air-tight. I've read many recipes that caution you in BIG CAPITAL LETTERS never to stir your starter with anything other than a wooden or plastic spoon. My starter is living proof that a quick stir with a stainless steel spoon won't hurt it. Let's say you use one cup of the starter to make Sourdough Bread. Replenish your starter by stirring in one cup of water and one cup of flour. After feeding or replenishing your starter, you should let it sit at room temperature for at least 12 hours, then stir and pop it back into the refrigerator. If you don't use your starter, you still have to feed it. Under most circumstances, it needs a feeding every two weeks or so. Just stir it up, pour a cup down the drain (I always feel like a murderer when I do this), then replenish as usual. Healthy starter will develop a yellowish liquid on its surface. The liquid contains 12% to 14% alcohol and is part of what gives sourdough breads their distinctive taste. 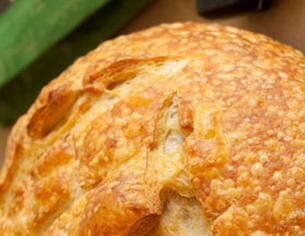 The alcohol dissipates during the baking process, so don't worry about getting tipsy from your home-baked bread. Be sure and stir the liquid back into the starter before using it. Starter is pretty tough. It can handle neglect surprisingly well. If you've ignored the needs of your starter well past two weeks, try to revive it before abandoning it altogether. It may look dark, but if it doesn't smell bad (or different from the way it usually smells), stir it well and give it a good meal -- use two cups of flour and one cup of water. Cover it, and leave it out on your kitchen counter for 12 hours or so. If you can see lots of tiny bubbles and if it smells right, you've succeeded in reviving it. Promise that you'll never neglect it again, and pop it in the refrigerator. If you want to increase the amount of starter so you can share it with a friend or use in lots of baking, just feed it more. Just remember to not refrigerator it for at least 24 hours after you've fed it in order to give the yeast an opportunity to "work." The so-called Amish Friendship Bread is a sweet variation of sourdough. Given that cooks have been inventing sourdough recipes for several thousand years, it is doubtful that it truly originated with the Amish, but that is neither here nor there. The popularity of this starter seems to ebb and flow every four or five years, and there's no denying it makes a fine cake. And, by the way, Friendship Bread is closer to cake than bread. It's bread the way Banana Bread is bread. The problem with Friendship Bread is that the starter process that is in general circulation is a lot more trouble than sourdough starter. First of all, this starter (and this is a milk-based starter) never sees the inside of a refrigerator; it lives at room temperature. Probably not a problem, but one never knows. Next, it takes 10 days to complete the cycle, during which time you have to stir the starter every day and feed it twice. Which leaves you with a large quantity of starter -- enough supposedly to give away to three friends. I can personally attest to having personal experience with this process and, I must say, I felt like a slave to it very quickly. In practically no time, I ran through all the friends I had who really wanted any starter. I found myself pressing it upon acquaintances. "C'mon. It's easy. You'll love it." I stopped caring about how good a home my starter was going to get. Then I started throwing it away. So I just quit. But there's a light on the horizon. The people at King Arthur Flour have come up with a new Friendship Starter that you make using sourdough starter. Best of all, it makes only enough for your own baking needs (although you can make more if you want to) and, once you get it going, it stays refrigerated. Take a cup of traditional starter and put it in a glass or ceramic bowl. Add the milk, sugar and flour and blend well. Cover with plastic wrap and let it work for at least 24 hours. Feed the starter you don't use in the cake with equal parts of milk, sugar and flour, enough just for you. Or, in friendship spirit, make enough to divide and share. Let it sit at room temperature for several hours to grow. After it's bubbly and healthy, store it in your refrigerator the way you store you other sourdough starter. If you give some away, remember to feed your starter so you'll always have the two cups you need for the recipe and a cup left over to grow some more. The first time you make a cake with this traditional-turned-friendship starter, it won't be quite as sweet as it will be the second time. You can either add a bit more sugar to the cake batter to compensate or try it as is. Either way, it is an exceptional cake. Preheat your oven to 350 degrees F. Combine the oil, sugar, eggs and vanilla and beat until light. Add the starter and beat until smooth. Blend the dry ingredients together and fold into the starter mixture. Pour into a greased Bundt pan and bake for 40 to 45 minutes. Just before baking, fold in up to 2 cups of chopped nuts, diced apple or applesauce, raisins or whatever seems appropriate. For a chocolate version, substitute 1/2 cup cocoa powder for the cinnamon and nutmeg and add any other ingredients at your own discretion. Some possibilities that come to mind are chocolate chips, chopped nuts, minced orange peel and rum or mint extract. If you've had any experience at all with the King Arthur Flour people, you know how good they are. Their cookbook is wonderful: The King Arthur Flour 200th Anniversary Cookbook. They have an excellent mail-order catalog which you can sign up for at their site or by calling 1-800-777-4434. These people know their stuff. You have to get a jump on pancakes made with sourdough starter by starting the night before. Combine the flour and sugar in a large bowl. Blend in the buttermilk and the sourdough starter. Cover and allow mixture to work overnight at room temperature. In the morning, beat together the eggs, butter or oil, salt and soda. Blend this mixture into the starter mixture. Batter will bubble and foam. Drop by 1/4-cupfuls onto a medium-hot griddle and cook until large bubbles appear. Flip over and cook until browned. Makes about 15 pancakes. Many recipes for sourdough bread call for yeast. The yeast assists the starter with the leavening, and the starter imparts the distinctive sourdough flavor. Add the ingredients to your bread machine in the order recommended by your machine's manufacturer. Use the "light" setting, if appropriate, and allow bread to cool in the pan for 10 minutes before removing. This recipes makes a 1-1/2 pound loaf. Cooking with sourdough is a vast subject. There are countless recipes and many, many cookbooks devoted to it. Whether you cultivate your own starter, buy one or inherit it from a friend or relative, you will soon begin to treasure it. Your starter, after all, is composed of living organisms. The longer you use and nurture it, the greater affinity you will feel for it. I hope you will begin to explore sourdough cooking. Having a starter means never again being completely alone in your kitchen.